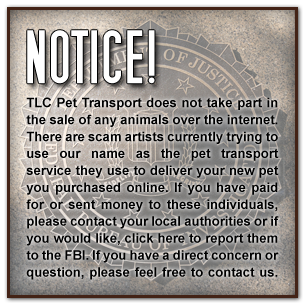 TLC has become the most popular nationwide pet and small animal transport service in the country. TLC~PET~TRANSPORT was the FIRST established USDA licensed, Private “families only” Pet Transport Service. We have been safely transporting your loved ones across America since 2001. TLC specializes in moving “one family at a time” to provide you and your pet family the safest pet relocation service possible. We give your kids the same love and care they get from you. Group Pet Transports are also available as we can have several pets but different families in the same van. Would you like to see our beautiful country? TLC Pet Transport is looking for qualified drivers who are pet lovers to become a part of out team at helping people relocate their pets throughout the USA. Please send an email to travelcare@fuse.net with your qualifications. Our safe method of Ground Pet Transporting provides for your pets every need. Our drivers are experienced Pet Movers. 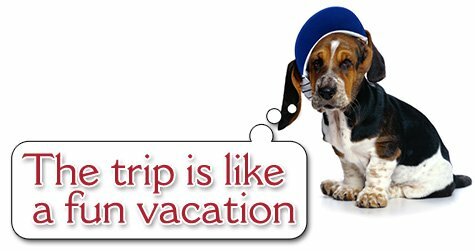 Your pets will travel by Minivan for both private and group transports. Group transports have a limit of 4 pets/crates per van. We do it this way to provide your pets the shortest trip possible. And also because it is more comfortable for them. We also use our larger, customized Ford Transit passenger van for families with many pets. It is equipped with built-in stainless steel crates. And each crate has it’s own heat and air. It just all depends on the size of your family. Cats are always kept crated for their entire journey, But their crates large enough to hold a full size litter box and also provides them with walking around room. They are soft sided with mesh windows that have zippers for easy access to tend to their needs. These crates are escape proof. We do not like to use cargo type vans because we feel they are too bouncy and noisy and impersonal. And there are no windows for them to look out. We do not want your pets to feel alone and separated from their driver by a partition. Our drivers talk to your pets while they travel. Doing this reduces their stress and makes the trip more comfortable for them. This is especially good for cat shipping and bird shipping. Cats need the least amount of stress possible. And birds need a smooth and draft free ride. We are also able to guarantee on time delivery within 1 to 4 days of departure, depending on the distance of your trip. A coast to coast transport takes only 4 days. Also, we do not give you a window time, instead we are able to give you your exact day for pickup and delivery. There are so many people that have multiple pets. TLC offers a “families only” Pet Transportation Package for your convenience. By transporting “one family at a time”, we find that it reduces the stress of being surrounded with other animals. It also eliminates your concern for infectious diseases. Also, your dogs do not need to be in a crate if you would prefer they lay on their beds for their trip. This is especially good for senior and disabled dogs. We also arrange your Private Family Pet Transport around your dates and schedules. You may choose your transport pickup date or delivery date. In addition to our private family Pet Transports, we also offer and provide intimate group Pet Transports for people with just one or two pets who do not desire or require that their Pets Travel by themselves. NEW SCHEDULE: Our group Pet Transports run coast to coast once a month. Our east coast pickups are on the 7th every month. And our west coast pickups are on the 11th of every month. We also offer east coast transports from Maine to Florida on the 15th of every month. And from Florida to Maine on the 17th of every month. So whether you are permanently relocating across the country or going on vacation and you want your pets with you or you are a snow bird just going away for the season, TLC~PET~TRANSPORT will deliver your dog-cat-bird-exotic door to door, safe and sound……happy and content. If you would like to discuss the Pet Transportation of any of your family members, please contact us. If you would like a quote for transport, please fill out our QUOTE REQUEST form or email us and your quote for transport, along with transport details, will be emailed to you in less than 24 hours from the date we receive your request. You must receive a written quote from our office before booking a transport with us. TLC PET TRANSPORT is a member of the Better Business Bureau.